Ferocactus hamatacanthus subsp. sinuatus is a smaller version of Ferocactus hamatacanthus. It is a barrel cactus with solitary or sparsely clumping, dark green stem up to 12 inches (30 cm) tall and up to 8 inches (20 cm) in diameter. It has 13 to 17 tuberculate ribs, circular to elliptic areoles up to 1.2 inches (3 cm) apart and 12 to 16 spines per areole. The flowers are funnel-shaped, pale yellow, up to 3 inches (7.5 cm) long and up to 3.6 inches (9 cm) in diameter. Choose a planting location that receives direct sun during all or most of the day. 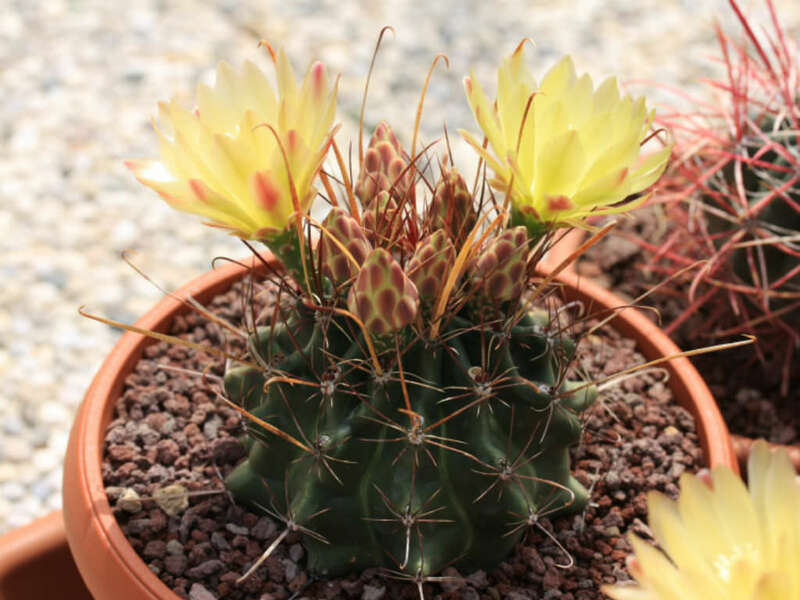 Because Ferocactus eventually leans into the sun instead of growing precisely upright and because it has extremely sharp thorns, place it where people will not brush into it accidentally. 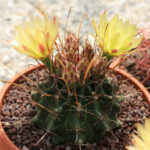 Plant your cactus in early spring before new roots begin to form. The roots may appear dry, but that is typical before new growth begins. Dig a hole deep enough for the plant’s roots and amend it as needed to provide fast-draining soil. A good soil mixture includes 10 percent native soil, 45 percent washed sand or pumice and 45 percent compost. Ferocactus thrives in poor and arid soil. Ferocactus hamatacanthus subsp. sinuatus is native to Mexico and United States.